at The Scuba DoctorFor those whose eyesight requires corrective measures, the prospect of scuba diving or snorkelling — a primarily visual pastime — can be a little daunting. Proper diver safety also relies on keeping a keen eye on your buddy, your location and your gauges. But a lack of 20/20 vision is by no means a barrier to diving, as there are many options available to facilitate participation despite all manner of sight issues. There are a number of factors behind the causes of visual impairments, including genetic malformation, disease, and — as with so many other things — the passage of time. Eye disorders brought on by conditions such as glaucoma, cataracts and diabetes require medical treatment or surgery, but by and large, defects in the optical elements of the human eye can be aided by the application of corrective lenses. These are collectively known as Refractive Visual Impairments and can be broadly split into four main categories: myopia, hyperopia, presbyopia and astigmatism (see the Types of Visual Impairments section below). Many scuba divers and snorkellers with mild vision impairment don't need to take any corrective action, as objects in water are naturally magnified by 33 percent. Divers who have more complex corrective requirements, however, will find this insufficient. If corrective measures are needed, there are several methods of compensating for sight problems underwater, making for safer, more enjoyable dives. One of the simplest ways to deal with poor eyesight is to wear contact lenses, just as you would on land. However, not all contact lenses are suitable for diving. Even with suitable soft contact lenes, certain precautions should be taken to minimise eye irritation and to prevent losing the contacts. The Diver's Alert Network (DAN) recommends using soft contact lenses for scuba diving, rather than hard contact lenses. Hard or Gas Permeable Contact Lenses (GP lenses). Gas permeable lenses can 'dig' into the eyes below certain depths, because of the pressure. The increased pressure may also cause hard lenses to suction to the eye, causing pain or discomfort. Hard contact lenses typically dry wearers' eyes out more too, resulting in redness and irritation upon surfacing. Bubbles can form between the hard lens and the eye, causing blurred vision, which effectively negates the purpose of wearing the contacts in the first place. Finally, hard contact lenses may cause the diver to experience blurred vision after a dive, as nitrogen is unable to escape the cornea properly. Soft Contact Lenses allow the nitrogen absorbed by the eye while diving to escape; hard lenses do not. Hoever, even soft contact lenses can collect waterborne organisms and become contaminated, causing eye infections. 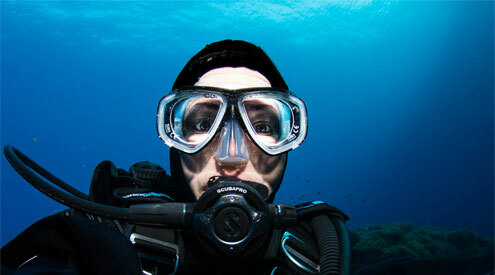 If you wear contact lenses under your mask for diving, you need to make sure you blink a lot. Excessive starring can cause bubbles to form underneath your lenses and which may cause minor discomfort and temporary blurring of vision. Also be sure to have a spare set of contacts (or glasses) available in case you lose a contact underwater. Wearing soft contact lenses underwater also means keeping the eyes closed when performing any skills that require the flooding or removal of the mask. If you are enrolling in a scuba course, be sure to tell your instructor if you wear contacts so that he or she will allow you to keep your eyes closed during skills, and to wear a mask during surface water skills or swim tests. Similarly, if you're using vision-correcting equipment, from contacts to a corrective lens or prescription mask, make sure to alert your buddy. If you should lose your mask underwater, your buddy needs to know that they'll need to help you find it. In terms of comfort, even soft contact lens wearers often report some dryness as a result of diving; it's a good idea to bring lubricating drops with you to the site for use before and after diving. Rinsing lenses in fresh saline solution between dives can also minimise irritation from residual salt water. 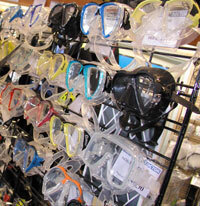 Divers should consider using disposable contacts for live-aboard trips so that they can use fresh ones each day. The most permanent alternative is corrective eye surgery, but it is imperative to consult an ophthalmologist before your first dive, after surgery, in order to respect the healing period. If not properly observed, the effects of pressure and trapped gas on an unhealed incision could be incredibly painful. There are alternatives to wearing contacts while diving for those who are squeamish about using them or simply prefer not to. Depending on the severity and type of eyesight issues, the lenses of some stock masks can be quickly and easily replaced with pre-made corrective lenses. Some of the masks with optional vision correcting lenses can be obtained with either a '-' dioptre (e.g. -1.5 to -8.0), or a '+' dioptre (e.g. +1.0 to +4.5), typically in 0.5 increments. Some divers require distance vision correction, that is, the diver is 'near-sighted' and the Rx Sphere value is a '-' dioptre. Other divers require a '+' Rx Sphere value lens because they are 'far-sighted'. 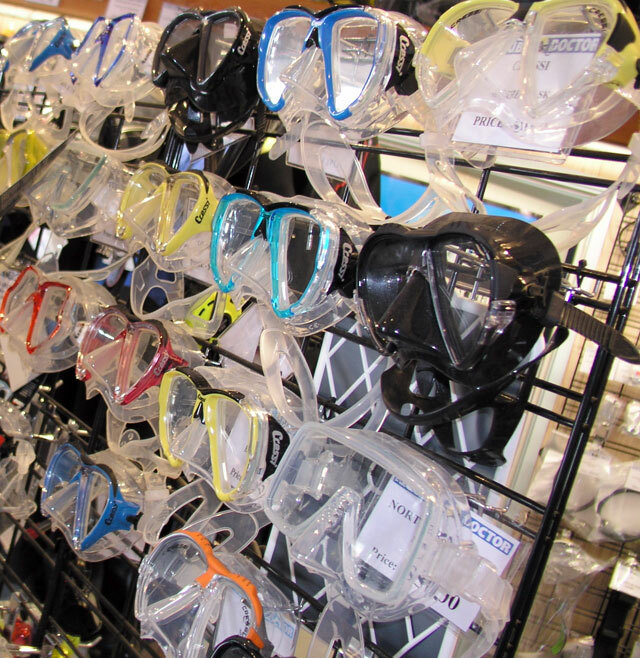 At The Scuba Doctor we sell a lot of Corrective Lens Masks and have a great selection of models to choose from whatever your budget. Please consult our online dive shop for . Finding the numerals on your gauge too small, especially in the dark? Finding you arm is not long enough, but have pretty good distance vision? If you answered yes to all the above, then you probably have presbyopia, a condition where the eye exhibits a progressively diminished ability to focus on near objects with age. On the surface the fix is reading glasses (those things you always forget just when you need them most). Bright light also helps, as it constricts the pupils, and decreases spherical aberration. Some people use prescription bifocals, trifocals or multi-focal lenses. Normal vision for top two thirds and "reading" (plus) correction for bottom third. Supplied with the bifocal lenses fitted, plus the original normal lenses. Under water the solution is a 'Gauge Reader' mask which uses bifocal corrective lenses. These lenses are clear on top, but have a reading correction in the bottom third of the mask lens. This makes them great for reading gauges, camera settings etc. We do not recommend adhesive magnifying patches, which are applied to a stock mask lens. Our customers very plainly tell us the after-market 'stick-on' or 'push-on' solutions simply don't work well, and we don't bother selling them. For the corrective lens bifocal masks we sell, each of the lenses are ground just like you would expect on a pair of eyeglasses. For those with astigmatism or other, more extreme vision impairment, pre-made corrective lenses may not work sufficiently. Custom-made full prescription lenses ground by an ophthalmic specialist are an option, wherein mask lenses are made specifically to cater for your combination of distance, astigmatism and reading impairments. But it's very expensive. We recommend you talk to Ozbob Scuba. The important thing here is to make sure that the person filling your prescription takes into consideration a variety of your needs. If you are a snorkeler you probably just need to see distance, therefore a distance only prescription should be fit in your mask. If you are a diver though, you may need both distance correction to see the underwater life and the near prescription to read you gauges, therefore, depending on your prescription, a true bifocal, or truncated, full prescription lens can be used. Fortunately, most divers and snorkelers only need either negative distance correction lenses, or gauge reading corrective lenses — clear or planar on top and a lower pane with positive correction for reading. 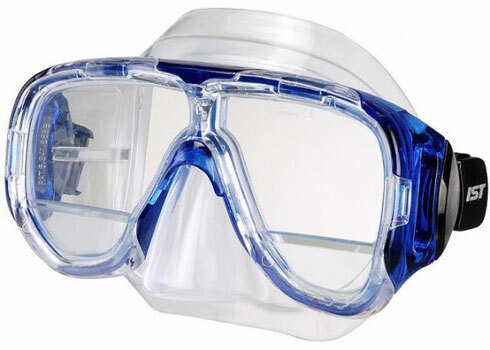 Those who opt for prescription masks should consider purchasing two customised masks in case of loss or damage to one of them, as it can be exceptionally hard to find a replacement in many of the world's remote dive destinations. We strongly recommend that you consult your optometrist about which underwater vision correction solution is best for you. Please feel free to show them this information, plus the more detailed information in the Prescription Lens Masks section of our online dive store. Your optometrist will be able to work out which solutions are available to you and make recommendations as to what to get. Your optometrist will also be able to provide the full details you need to order a prescription lens mask. If you choose to go with a corrective lens mask, your optometrist will give you the best spherical correction dioptre values for your left and right eyes given the half dioptre increments of corrective lenses. Sphere: Spherical lenses are required to correct near- and far-sightedness by compensating for the incorrect focal length of the natural eye. Corrections are given in dioptres (diopters in the US), a measure of the optical power of the lens based on its size and curvature. Negative dioptres are used to correct myopia, and positive dioptres to correct hyperopia and presbyopia. Dioptres are usually prescribed in increments of plus or minus 0.25. 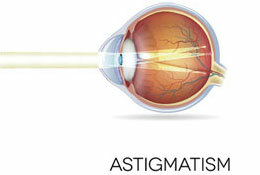 Cylinder/Axis: Astigmatism is a condition that requires a lens that focuses light into a line, rather than a point, as is the case with spherical lenses. The cylinder strength is given as a dioptre, and the axis is the degree to which the cylinder is rotated to correct the direction of the aberration. Lenses that combine both spherical and cylindrical designs are known as toric lenses. Add: This is an additional prescription, usually to compensate for presbyopia in conjunction with one of the other conditions, resulting in a different optical power in the lower half of the lens, creating 'bifocal' lenses. Scripts for eye glasses are usually prescribed in dioptre increments of plus or minus 0.25. Most of the corrective lenses for mask are only available in dioptre increments of plus or minus 0.5. If your script for an eye is say -1.75 dipotre, your value will need to be adjusted up or down. Your optometrist or ophthalmologist will know what's going on with your eyes and usually be able to give you the adjusted left and right eye values we need. We can't do this for you, and we highly recommend you don't try doing it yourself. Consult your Optometrist! 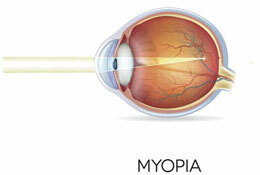 Myopia: also referred to as short- or near-sightedness. 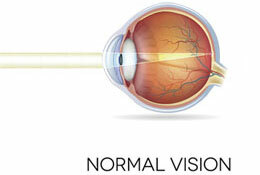 It occurs when light entering the eye is focused at a point in front of the retina. Nearby objects appear normal, but distant objects appear blurry. Myopia is by far the most common form of visual impairment.